Here we are. The end of another year. I can’t believe how quickly 2013 went by. I’ve read time passes by faster as we age because our days become more routine and predictable. When we’re surrounded by the usual people, work, and experiences - the details stand out less and our days merge into fleeting moments. Or perhaps the older we get, the more disproportionate each unit of time becomes. When we’re 5, a year is 20% of our life experience. When we’re 40, a year accounts for only 2.5%. Whatever the reason, it often seems like Ryan Seacrest is counting down another giant ball falling down all too soon. Life passing me by is a big fear of mine. I don’t want to look back a couple years from now and wonder, “where did the time go”. Which is why I feel it’s important for everyone to take stock of where they’ve been and what they’ve done from time to time. To refocus and ensure their time and energy is spent on stuff which really matter. For me, 2013 was an amazing year. I overcame new challenges, visited new places, and had many great laughs and moments with my friends and family. It wasn’t a walk in the park, but I’m glad for all the experiences, good and bad. Here are some personal highlights. In 2012, I set a goal to run 100 miles. I ended up completing 77 runs for 125 miles, far surpassing my expectations and igniting a new passion in the process. 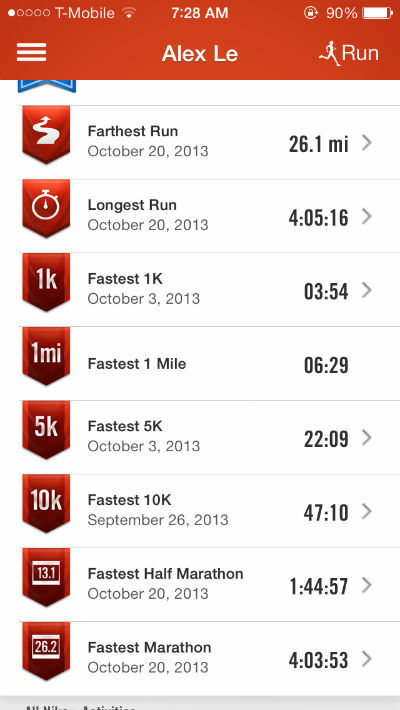 For 2013, my main focus was to complete a half-marathon in May. It turned out to be the best race I had ever participated in, but I wasn’t done yet. Four months later, I finished my first marathon! 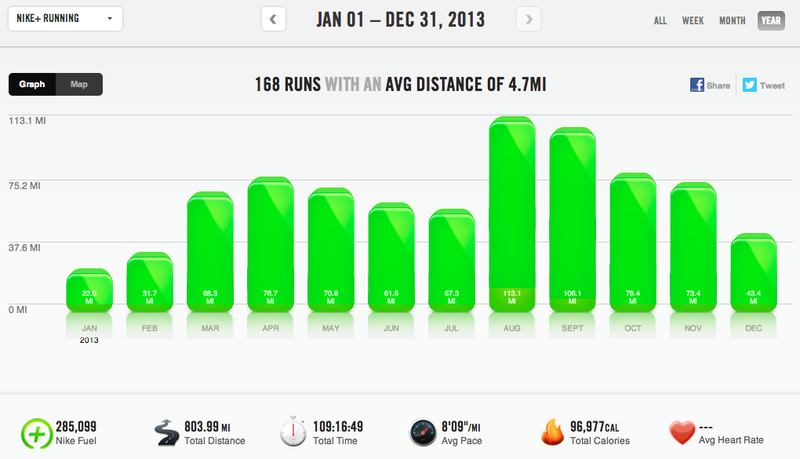 By the end of the year, I had amassed a total of 168 runs for 804 miles! What a difference a year makes. I also set new Personal Records in almost every running category. Fastest 1k, 5k, 10k, 13.1, 26.2. Longest and farthest runs. I even became a Nike Run+ Blue Belt. I firmly believe distance running is one of the few sports a person can get better at as they get older. Overall, it was a fantastic and fun year on the road. I never thought I would be saying this, but I’ve really grown to love running. It has become such a major part of my life, so much so that I want to run forever. 2013 was an active and rewarding year for me at Seagate. I had the chance to work on some key projects for the company, one of which is creating some buzz right now. My proficiency in the code has increased greatly, and I’m more confident in code analysis and decisions. Outside of work, I made progress on most of my side projects. The one I’m most proud of is ShouldAlexRun. While not fully finished, it’s a lean and working “MVP” (Minimum Viable Product). I hope to flush out the functionality next year. Here’s a description of the app. Alex likes to run. However, he’s very picky and only likes to run when the weather is optimal. 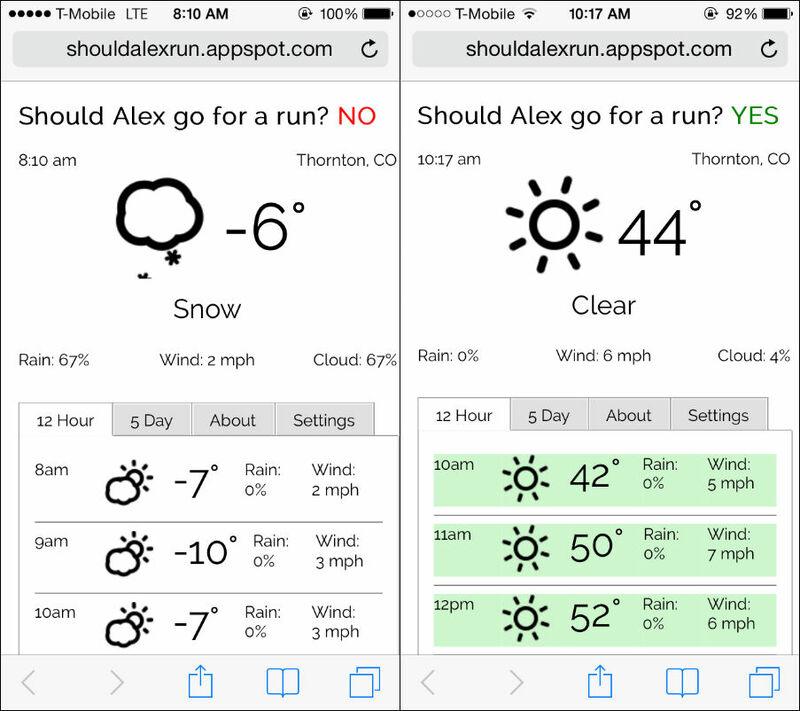 This is an app to query current and future weather conditions to find the best time for Alex to run. As I’ve gotten older, I’ve found it more and more difficult to maintain muscle mass. Cranking out curls and bench presses weren’t cutting it anymore, unless I wanted to spend 5 days a week in the gym. No thanks. Last year, a friend suggested some basic CrossFit exercises to try and I’ve been hooked ever since. Just for the record, I don’t consider myself a “CrossFitter”. Nor do I “CrossFit”. I’m just a newbie who’s incorporated CrossFit’s theme of functional, varied, high-intensity movements into my own workouts. In other words, I superset every lift. I concentrate on compound exercises which use multiple muscles. And every couple of months I try a new CrossFit movement. First was burpees. Then Wall-Balls. Then Thrusters. This year, I worked on Deadlifts, Kettle-Bell Swings, and Kipping Pull-Ups. My most proud achievement, however, is completing 10 consecutive Muscle-Ups. 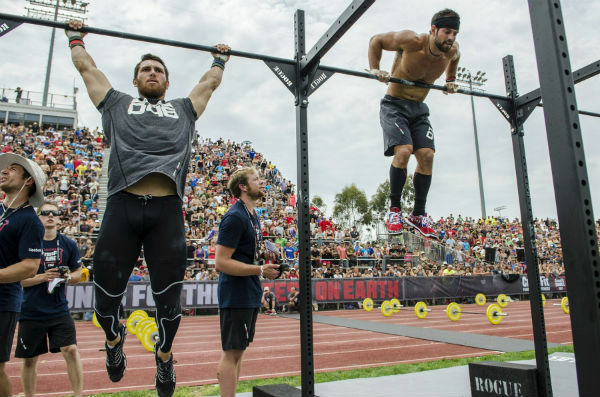 What’s a Muscle-Up, you ask? Essentially, it’s a Pull-Up to Dip in one fluid movement. Instead of stopping when your chin reaches the bar, you continue pulling until your upper body is above the bar, where you then transition into a full Dip on top of the bar. It’s one of the more advanced and coveted CrossFit exercises, and considered by some as the king of bodyweight exercises. It took me 3 months just to do one, and 2 months more to work up to 10. A huge milestone for me, and reminder that just because something looks easy doesn’t mean it is. I’m delighted with the results from practicing these new CrossFit movements. On top of it, they’ve re-energized my workouts and have given me new challenges to work towards. I have to admit, I’m a bit sad to be putting a close on 2013. At the same time, I’m excited for a fresh start and chance to see what limits I can reach in 2014. In fact, I’ve already signed up for another marathon. I have plans to take my career to the next level. I purchased a speed-rope last month and have begun work on my next CrossFit exercise, Double-Unders. What else will 2014 hold for me? I’m not sure, but I can’t wait to find out. Happy New Year everyone, let’s make 2014 count.